The HIT Series of duct mounted centrifugal in-line fans is suited to a wide range of residential, commercial and industrial exhaust or supply air applications, such as toilets, kitchens, bathrooms, offices, restaurants and equipment cooling. 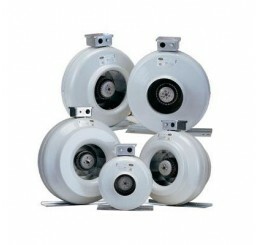 All models are designed for direct connection to standard diameter circular ducting and comes standard with manufacturing. Corrosion resistant pressed galvanised sheet steel body with backward-curved centrifugal impeller . Electrical terminal on flying lead. – 60Hz available upon request. Bearings – sealed for life, ball. Speed – controllable with 2-speed switch available for Hi/Lo speed operation . Auto-reset thermal protection is supplied as standard on all units. Can be mounted on any angle. Suitable for ducting on intake and/or discharge side and for supply or exhaust applications.